Order high-quality prints from any of the hundreds of pictures in our Global Children's Art Gallery, or send in a picture by your own child! The pictures are printed on 8½" X 11" premium photo paper (matte or glossy) or high-quality canvas cloth, and are suitable for framing (images are printed up to 8" X 10", depending on aspect ratio). 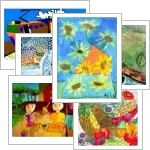 Each print comes with a separate 2" X 3½" card listing information about the picture and artist. Proceeds help support this website and the work of The Natural Child Project. To send your own picture, email it to ncp-shop [at] naturalchild.org. About image quality: As most of the pictures in the Gallery were sent in by email, the clarity of a print is dependent on the resolution of the original file. We use professional image enhancement software to improve the printed quality of low resolution pictures. If you are unhappy with the quality of your prints, we will gladly offer a refund or replacement.